Hazelcast offers many features to developers working with systems of all shapes and sizes. 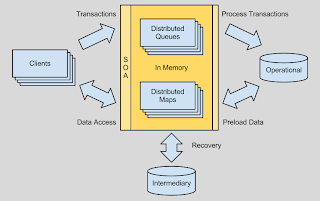 Hazelcast's implementations of distributed Queue and Map offer possibilities of running Web applications while operational systems are down for maintenance or unavailable. Here is an approach to solving such a problem with Hazelcast. Let's start with our business model. We sell widgets online and through our call center. We also service order and customer related issues in our call center. Every evening, our widget product database is inaccessible because of some maintenance tasks. Here is one place where Hazelcast fits into the picture. Before our maintenance window, we preload the widget product data into a Hazelcast distributed Map named "widgets". Each map entry has a key, which is our unique widget id, and a value, consisting of a Widget object. Now, our Web applications can access product data from our Hazelcast distributed Map "widgets", rather than relying on our product database. When an order is created, Hazelcast's distributed Queue comes into play. The Web applications can submit an order and it will be passed into our "orders" distributed Queue. Here we can keep our orders ready and waiting until our database comes back online. 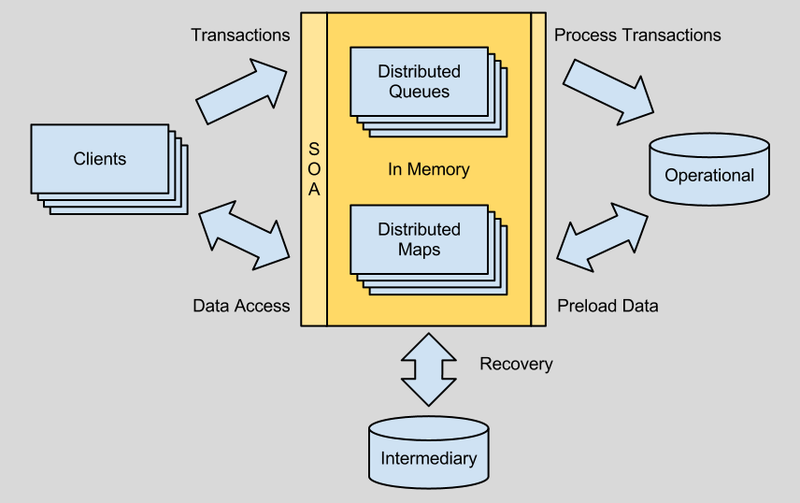 We configure our Queue to be backed by a Map so our "orders" elements, consisting of Order objects, can be persisted in our intermediary storage before being processed when our target datastore comes off of maintenance mode. A big part of this solution is to have a great services or middleware layer that can take on the burden of working with our distributed Maps and Queues. This will create a good abstraction of our backend datastore and distributed data from our Web applications. As a service oriented architecture is a common approach to abstracting a backend from Web applications, this solution does introduce some complexity into the services or middleware architecture. With a mature services layer, our call center and online applications can create orders, search through our widgets that exist in our "widgets" distributed Map and even verify and validate orders that are currently only in our distributed Queue "orders" or our Map that is backing our Queue. This type of solution does take some up front planning, but 24/7 business comes at a cost.